One of the most significant exposures of aluminum is through vaccinations. Other exposures include foil, kitchenware, automobile and aircraft industries.Workers who are at risk for toxicity are those in refineries, foundries and also welders and grinders. Persons on dialysis can also have toxicity. Aluminum is the third most abundant element after oxygen and silicon. Aluminum is the most abundant metal and constitutes between 8.4 to 14 percent of the earth’s crust. Aluminum is found in plants, soil, water and air. The average person my absorb anywhere from 10 to 100 mg of aluminum every day through aluminum deodorants, cookware, baking soda, antacids, and other environmental sources. Normal excretion through the urine is 15 mcg per day or more. Most plants have low quantities of aluminum, but a few are known to be aluminum accumulators, including some types of tea plants, grasses and orchids. Aluminum smelters, coal and oil burning power plants release fine metallic particulates of a sulphate complex type of toxic metals. These metals are easily absorbed into the blood, intercellular fluids, through the cell walls and even into the nucleus where they can affect the DNA. The gases are converted into aerosols by exposure to the sun, by condensation or by attaching themselves to other particles in the air. The neurotoxicity of aluminum is increased by intake of other metallic ions such as arsenic, cadmium, iron, lead, manganese, mercury or other toxic metals. A low intake of zinc contributes to retention of many heavy metals as well as a higher sensitivity to their effects. When aluminum replaced calcium in low amounts in vitro neuron studies, the action potential was blocked, decreasing spontaneous nervous discharge and reducing nervous activity. 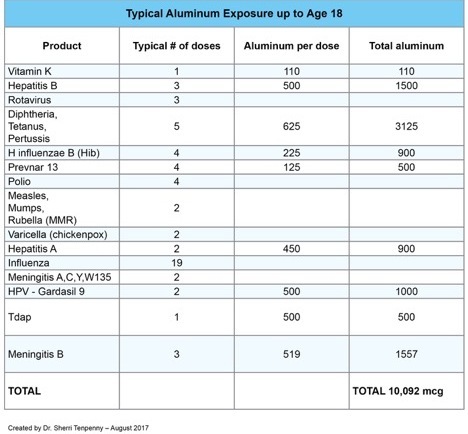 Disorders Associated With Aluminum Toxicity include: Autism, Alzheimer’s Disease, anxiety, conjunctivitis, eczema, upper airway irritation, pneumoconiosis, those under dialysis, neurotoxicity and osteomalacia. It is estimated that 93% of people tested are high in aluminum toxins! No matter how aluminum enters the body, it is dangerous for the brain. Patients who died of Alzheimers, Lou Gehrig’s disease (ALS) and Parkinson’s Disease with dementia have high aluminum and mercury levels. Aluminum enters into cross-linkage within the body’s proteins and acts to immobilize reactive molecules within the brain cells. It causes free-radical pathology inside neurons. Free radical damage of brain cells brings on molecular cross-linkage throughout the brains tissues. Heavy exposure to aluminum toxins through childhood vaccinations is the most profound ways that aluminum toxins enter the bloodstream, brain and other essential organs where it is not easily removed. Aluminum is poisonous to the nervous system. High levels of aluminum are associated with insomnia or sleep difficulties, nervousness, emotional instability, memory loss, headaches and impaired intellect. Aluminum can stop the body’s ability to digest and make use of calcium, phosphorus and fluoride. This prevents bone growth and reduces bone density. Aluminum can also cause conditions which actually force calcium out of the bones, like in fibromyalgia. Aluminum brings on weakness and deformation in the bone structure with crippling effects. Aluminum is used in vaccines as an adjuvant. An adjuvant is vaccine component that boosts the immune response to the vaccine. Adjuvants allow for lesser quantities of the vaccine and fewer doses. The adjuvant effects of aluminum were discovered in 1926. Hepatitis A, Hepatitis B, Diphtheria-tetanus-containing vaccines (DT, DTaP), Haemophilus influenzae Type b (HIB-b), and pneumococcal vaccines. Aluminum adjuvants are not used in the live, viral vaccines, such as Measles, Mumps, Rubella (MMR), Varicella (Chicken pox) and Rotavirus. Aluminum salts, monophosphoryl A (a detoxified bacterial component), and squalene (a compound of the body’s normal cholesterol synthesis pathway) are the only materials that can be used as adjuvants in the United States. 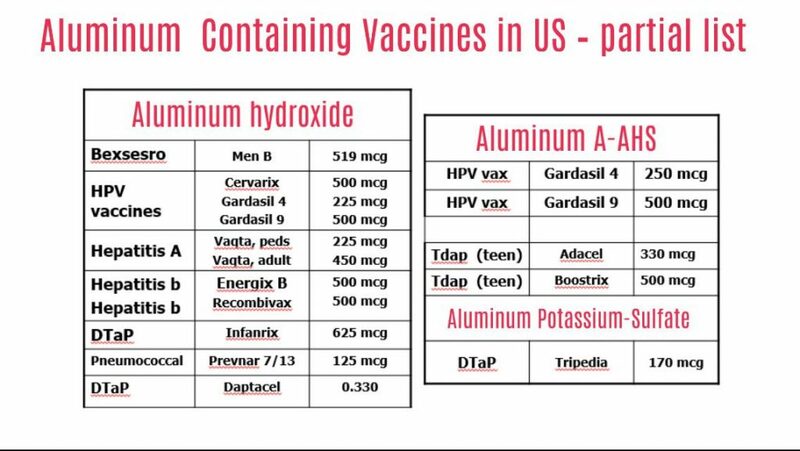 The quantities of aluminum present in vaccines are low and are regulated by the Center for Biologics Evaluation and Research (CBER). Infants receive about 4.4 mg of aluminum in the first six months of life from vaccines. Breast-fed infants ingest about 7 mg, formula-fed infants ingest about 38 mg. Infants who are fed soy formula ingest almost 117 mg of aluminum during the first six months of life. Remember however that the body’s way of processing ingested aluminum is totally different that INJECTED aluminum. Aluminum builds up in the bones and brain and can be toxic. Aluminum can cause neurological harm. Aluminum overdose can be fatal in patients with weak kidney’s or kidney disorders or in premature babies. This means that for a 6 pound baby, 11-14 mcg would be toxic. The Hepatitis B vaccine given at birth contains 250 mcg of aluminum – 20 times higher than safety levels allow. Babies weigh about 12 pounds (5.5 kg) at 2 months of age when they receive 1,225 mcg of aluminum from their vaccines. This amount of aluminum injected is 50 times higher than safety levels. Arthritic bone growth, spurs, etc. Heightened sensitivity to light or darkness. Abnormal sensitivity to hot and cold temperatures. An aversion to noise, touch, movement, odors, etc. Feelings of inferiority, embarrassment or shame. Feelings of irritability, agitation or annoyance. Irrational outbursts of anger, road rage, bad temper, etc. Poor bone growth, because aluminum prevents healing of bones. Aluminum can get into the brain at any age and is delivered to children through vaccinations, many of which have high levels of aluminum. Hypersensitive infants appear to be healthy, but when their symptoms are diagnosed as colic, it is most often aluminum toxicity including from vaccinations given or shortly after birth. Alzheimer’s disease is understood to have a strong connection to the accumulation of aluminum. Aluminum crosses the placenta, which means that infants may be intoxicated even before they are born. Aluminum also enters breast milk, so even the nursing infant is at risk; depending upon the level of toxicity in their a mothers diets, these children are born mentally handicapped. Some aluminum toxic babies are born with serious brain disorders that can be directly attributed to the mother’s diet or habits. Children with hyperactivity, ADD/ADHD and attention deficits and aggressive behaviors from a very early age have high aluminum. As children grow and develop, they become confused about rules and are unable to control themselves. They may use poor judgment and make bad decisions. Lack of impulse control in teenagers is very common with aluminum toxicity. Symptoms of aluminum toxicity at any age will include memory loss, not just for Alzheimer’s disease. The brain can malfunction in any number of ways after being exposed to aluminum. Many traumatizing problems are caused by aluminum toxicity. Signs of hypersensitivity should not be ignored, they should be invested and the help of a skilled Homeopath for aluminum detox should be used. Stop aluminum consumption and stopping all vaccinations is critical for the body to have the chance to detox aluminum. Aluminum has permeated mainstream products and it is not possible to avoid exposure. Aluminum is found in numerous foods and beverages including fruits and vegetables, beer and wine, seasonings, flour, cereals, nuts, dairy products, baby formulas, and honey. Typically, adults ingest 7 to 9 milligrams of aluminum per day. Aluminum is used for manufacturing of airplanes, siding, roofing materials, paints, pigments, fuels and cigarette filters. Aluminum is found in health products including antacids, buffered aspirin, antiperspirants and many vaccines. We use homeopathy to gently detox aluminum, mercury and other heavy metals from vaccinations or other accumulations. Detoxing requires the balancing the oxidation rate and enhancing the activity of the eliminative organs, especially the kidneys and liver. It is important to use daily non-toxic chelating agents such as Vitamin C which helps promote the excretion of aluminum from the body through urine. Silicea as the homeopathic remedy and the cell salt helps aluminum to be excreted via urine but allows essential metals, such as iron and copper, to stay in the body. Studies have also shown that drinking silica-rich mineral water each day for 12 weeks helps to remove aluminum from the body. There is evidence that drinking silica-rich mineral water decreases body levels of aluminum in people with Alzheimer’s disease. In some patients, it simultaneously improves cognitive performance to a significant degree. Silica has additional health benefits and when taken in the form of choline-stabilized ortho-silicic acid, it stimulates collagen production and connective tissue function and repair. Silicea has been shown to help to increase bone mineral density in osteoporosis and improve the appearance and texture of aging skin, hair and nails. To try this form of silica, follow the recommendations on the BioSil or Regenemax bottle. L-theanine which is found in green tea is know to help in alleviate the negative effects of aluminum-induced toxicity in the brains of rats. If you want to take L-theanine, take a 200-mg capsule before bed. If you suffer from anxiety or feel highly stressed, you can also try an additional 200 mg of L-theanine during the day for enhanced relaxation without sedation. Green tea extract contains small amounts of L-theanine, along with other important compounds with medicinal effects, such as epigallocatechin gallate and epicatechin. A recent study in rats with high aluminium levels speculated that green tea extract reduces aluminum-induced brain toxicity through its antioxidant effects as well as its ability to improve the functioning of synapses between neurons. Green tea extract and L-theanine may help reverse aluminum toxicity and treat cognitive impairment even better when used in combination. In one recent randomized, double-blind, placebo-controlled study, 91 patients with mild cognitive impairment took 1,680 mg per day of a combination of L-theanine and green tea extract for 16 weeks. The combination led to improvements in memory and selective attention. Brain theta waves, an indicator of cognitive alertness, were increased significantly for three hours. Bacopa monniera is an herbal extract that can protect the brain from aluminum poisoning. Researchers recently discovered that bacopa extract prevents aluminum toxicity in the cerebral cortex of rats. If you want to try bacopa, use the dose most commonly used in human research of 300 to 450 mg per day of an extract standardized to contain 55% bacosides. Curcumin is a well-known anti-inflammatory and antioxidant compound found in turmeric. It has anti-inflammatory properties and is an excellent option for brain protection in anyone with a chronic disease related to inflammation: joint disease, heart disease, diabetes, autoimmune disease, fatigue, depression, cancer, etc.. It will protect the brain against cognitive dysfunction and oxidative damage caused by aluminum poisoning. In one study, rats given aluminum showed poor retention of memory in maze tests and displayed marked signs of oxidative damage within the brain. The rats were given curcumin and significantly improves memory retention, ameliorated the oxidative damage,and reduced aluminum levels in aluminum treated rats. Look for turmeric extracts standardized at 90% to 95% curcumin and take at a dose of 500 mg two or three times daily. Malic acid helps to reduce the toxicity of aluminum in the brain. Magnesium malate supplies malic scid and is available in most health food stores. It is found abundantly in fruits such as apples and is also produced in the human body. It is a metabolite of the Krebs cycle the set of biochemical reactions used to produce 90% of all energy in the cells of the body. Malic acid readily crosses the Blood-Brain-Barrier and has been shown to bind to aluminum. It functions in the body by drawing aluminum away from the tubulin enzyme, so that Magnesium can plug into the receptor sites instead. Malic acid’s unique ability to bind with aluminum means it can be flushed out of the body, preventing unwanted build-up. The aluminum chelation protocol calls for 500 mg of malic acid three times a day for no more than three weeks at a time. We highly recommends that you work with a professional who can monitor your tissue levels and advise you on the protocol. If you believe you may have elevated aluminum levels, ask your doctor for a hair tissue mineral analysis. Cilantro accelerates the elimination mercury, lead and aluminum thru the urine. Selenium the mineral selenium each help to reduce the toxic effects of aluminum. Recommended dose is 200 mcg per day. Selenium also chelates mercury in the body. Vitamin C and Vitamin E both help to reduce the toxic effects of aluminum. Other nutrient therapies which improve the activity of the liver, kidneys, bowel and the skin can be helpful! A healthy, organic diet high in fruits, vegetables, grass fed red meat, nuts and whole grains is also important. Proper levels of folic acid, B6, B12 can counter high aluminum, but the higher the aluminum, the harder it is to absorb these essential minerals. Typically, adults ingest 7 to 9 milligrams of aluminum per day. Aluminum cookware – use glass cookware or enamel cookware and pots instead of aluminum. Aspartame – avoid this, as it contains 60% aluminum. Digestive aides such as diarrhea and hemorrhoid medicines can also contain aluminum. Antacids like TUMS with aluminum hydroxide, antacids of all types contain aluminum. Baked goods have approximately 5-15 mg aluminum per serving. Canned beer and sodas that are drunk from aluminum made cans. Cheese – processed, single slices (like Kraft singles). Just one (1) slice of individually wrapped processed cheese can contain up to 50 mg of aluminum. The cheeseburger contain one of the highest aluminum contents of any food! Colgate brand toothpaste – it is high in aluminum. Cosmetics – many types including makeup and eye shadows contain aluminum. Deodorants containing with aluminum hydroxide. Food additives in the USA have 6 aluminum salts; the salts most commonly used are sodium aluminum phosphates and are added to cake mixes, frozen dough, pancake mixes, self-rising flours, processed cheese and cheese foods. 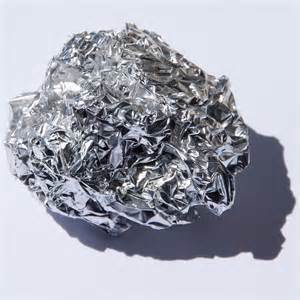 Food cooked or stored in aluminum pots and aluminum foil is another source of aluminum. As much as 4 milligrams of aluminum can be transferred to each serving of an acidic food such as tomatoes or citrus fruits that has been heated or stored with aluminum. Processed and frozen foods with containers can contain aluminum. Pickles that contain “alum” will contains aluminum and attack the bone. An average sized pickle contains 5 to 10 mg if it has been treated in an alum solution which is common. Alum is a form of aluminum sulfate that is used in the pickling solution to firm up the cucumbers. Steamers and strainers made from aluminum used in cooking contaminate vegetables. Turmeric helps detox the liver and kidney’s that hold aluminum to help them clear it. Spice or capsule form. The case against aluminum in vaccines.